Ridley Scott, the director of the popular epics, Gladiator and Kingdom of Heaven, has tried his hand with the story of the Exodus. But I must say before I begin that I feel in a precarious position in critically engaging this movie because I am a Christian who deeply loves the story of the Exodus. Of course, none of us are without bias, but there might be an expectation that a Christian will necessarily bash a film simply because it doesn’t follow the story exactly according to the Biblical literature. We must acknowledge, however, that lovers of the original works of literature, whether it may be Exodus or Harry Potter, will naturally have high expectations (at times unrealistic) for the film adaptation, and will likely be disappointed. But with the change of medium (film verses literature), there has to be a reasonable expectation that certain aspects will be different. I believe many people wrote off Aronfsky’s Noah focusing more on the divergent details instead of truly listening to what the story was saying. And in many ways, I believe that film had much to offer for Christians (and non-Christians) to reflect on and even celebrate. (For my perspective of Noah, see Brandon Terry’s review here.) So, we will attempt to critically engage Exodus for what it is, on its own terms. First of all, the thing that struck me the most as I watched Exodus was the potential of making biblical stories come to life. (To this day I am surprised there has been no Hollywood attempt at the story of David.) The visuals of the film were astonishing at every level from the sea of blood to the locusts swarming over the land. Scott is at his best in depicting huge landscapes of particular eras, whether that be Rome (Gladiator), Jerusalem (Kingdom of Heaven), or Egypt. It is well worth it to see the film on a big screen. There were some obvious criticisms of the film. There was no little controversy over the “white wash” casting. Of course the casting only matched many of the anachronisms of the film, where economics are discussed like Adam Smith, military affairs are discussed like Napoleon, and Moses is a postmodern atheist before his “conversion.” Although the film was not a documentary, some of these foreign aspects were distractions within the context of Ancient Egypt. It would be entirely laborious (as well as unnecessary) to point out all the deviations between the story as depicted in the Biblical literature and that which was depicted in the film. But in order to interact with the film faithfully we must meet it on its own ground (and not what we would hope/want it to be). The basic framework of the story is still present. Moses grows up with the privilege position as a “prince of Egypt,” brother to the future Pharaoh. Subsequently he falls from this status and is exiled, where he meets his wife and settles in for some time, while the Hebrew slaves in Egypt continue to suffer under tyrannical rule. God eventually “appears” to Moses conscripting him as his chosen leader to bring the Hebrews out of slavery. Moses returns to Egypt to fulfill his task, but not before God demonstrates his strength and power over the “gods” of Egypt. While the essential framework is present, Scott definitely gives the story his own twists and perspective. But I don’t believe he succeeds in giving a compelling version of the classic narrative. 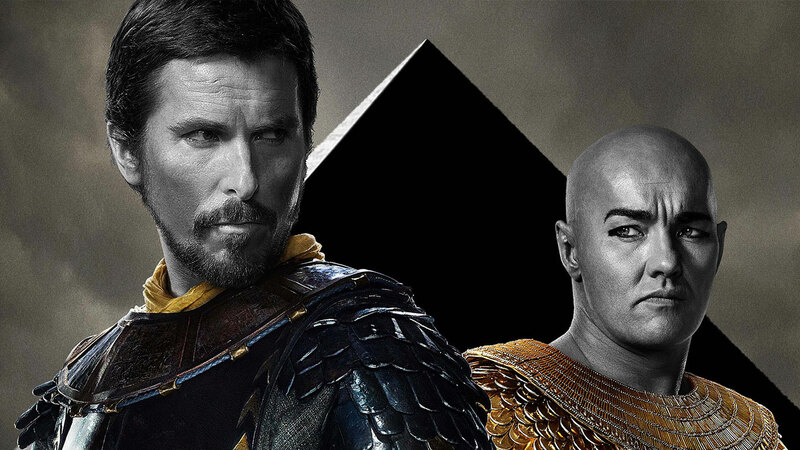 Even with solid performances by Christian Bale (Moses) and Joel Edgerton (Rameses), the action sequences and visuals seem to either drive or overshadow the actual story. Given that Scott called religion “the biggest source of evil” in an interview, it seems odd that Scott would take on this deeply religious project apart from the chance to film the epic plagues and battle scenes. This perspective seems to come through in the story telling and character depiction, which makes it feels like Scott never fully reconciles with the material, even to the point that he is even remotely fond of the characters (especially God). It felt like a film project given to a student who didn’t like the subject material but had to do it to pass the course. Thus, the film ultimately felt uninspired and the audience was left without a true hero. It seems now customary to focus on the relationship between Moses and Rameses when treating the Exodus narrative at a popular level (i.e. Prince of Egypt). But even though this was the focus of Scott’s film, the story still highlighted the key theme in the Biblical narrative: the battle between Yahweh and the gods of Egypt. In fact, I was surprised that Scott didn’t provide a completely “naturalistic” presentation of the material, much like Wolfgang Peterson’s treatment of the Iliad in his film Troy where all “supernatural” elements were lacking. Rather, Moses, who is a wise, careful, reasoned, and efficient general, is a spectator to God’s battle against Egypt in most of the film. Thus, the most important element of the Biblical narrative is essentially presented in the film: Yahweh defeats the gods of Egypt, redeeming his people from slavery so they might become his people. However, while many of the fundamental elements of the Biblical story were at least implied, the manner in which they were portrayed undermined the Biblical portrait of God’s character and actions. I am not sure what the motivation was behind depicting God as a pre-adolescent boy, but it definitely is not a flattering characterization. At least in Aronofsky’s Noah God is portrayed as transcendent and elusive, which is a significant part of Noah’s internal struggles throughout the movie. But in Exodus, God is portrayed as a kid who impetuously orders around a grown man, which comes across as confusing and strange even apart from the Biblical literature. The portrayal here seems to suggest that God’s actions should be considered similar to that of a child who simply hasn’t gotten his way. Thus, while Yahweh’s defeat is in accordance with the Biblical narrative, Scott’s portrayal of Israel’s God makes the victory seem arbitrary and spiteful. Thus, Scott most likely believes that neither the Egyptians nor the Israelites were in the right in the story of the Exodus. What that means in regard to the narrative of the film is that Scott gives the audience no true hero to pull for, to fight with, to mourn with, to celebrate with. We sympathize with both Moses and Rameses but we don’t agree with (or understand) their motivations and are definitely not inspired by them. Moses begins as a product of the enlightenment, but then turns into a charismatic/schizophrenic/unstable leader, unsure why he is obeying God. Rameses is violent, power-hungry, arrogant, and considers himself a god, but also hypocritically calls into question the violent acts (and nature) of the Israelite God. The Israelite God is literally a child who simply seeks petty revenge, and never comes across as one who would be worthy of worship let alone any sort of obedience. In Scott’s story we might have gods and kings, but we have no heroes. And whether you agree with Scott or not about religion, a story without a hero doesn’t make a very good story.